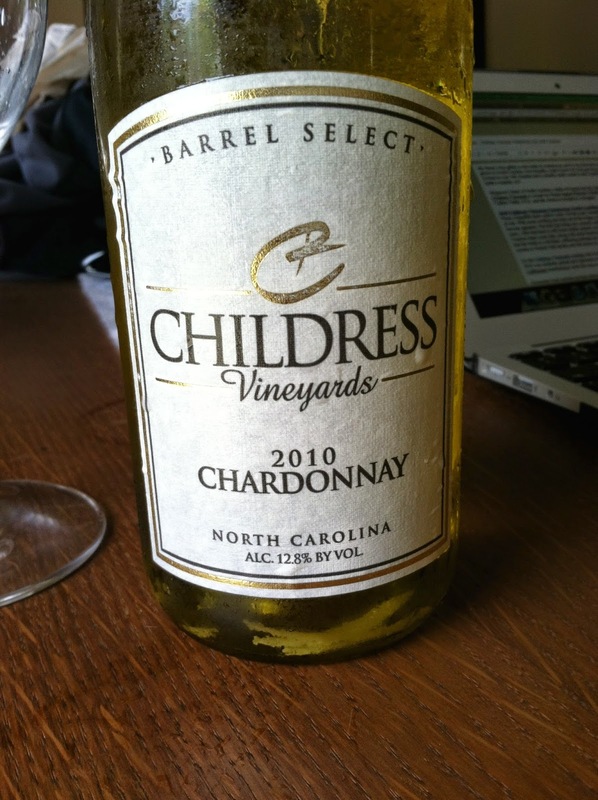 Childress Vineyards: Chardonnay from North Carolina! Have you ever had Chardonnay from North Carolina? I have not, nor have I tasted any wine from that state, ever. Not a state known for wine growing or production, North Carolina is home to over 100 wineries and is actually ninth overall in the United States as far as production. Quite a surprise, no? Here's a link to some interesting facts on North Carolina wine. Whenever I think of North Carolina, I think of Nascar and the Appalachian Mountains. Coincidentally, Childress Vineyards is owned by Nascar legend Richard Childress! The grapes for this are in the Yadkin Valley AVA, and the winery is located in Lexington. My friend Alina attended the 2011 Wine Bloggers Conference in Charlottesville, Virginia, where she came into possession of this bottle. She was kind enough to gift it to us earlier this year and it's lain in my cellar since then. Given the hot, muggy weather we're having, a cold glass of wine seemed in order. Pours a beautiful straw-yellow color. On the nose I immediately get ripe tropical fruit, lees, and a touch of oak. With some swirling and time out of the fridge, a bit of buttercream and something like bacon fat become apparent. The first sips bring out a smooth, soft apple and pear thing along with more creamy notes. I like that there is still some acidity present, as it helps lighten the ripeness and richer flavors. Tropical notes come later, along with some barrel spices on the finish. My only gripe on this wine is that the finish is a bit bitter, reflecting perhaps too much pressure in the grape press. It spent nine months in French Oak barrels and that shows in a good way, with just a bit of woodsy flavor throughout. 12.8% abv. $14.99 SRP. On the Childress Vineyards website, this is listed at $14.99, though that's for the 2011 vintage. This 2010 was similarly priced and represents a fantastic QPR. I wish more similarly priced Chilean and Californian chardonnays were this easy to drink. Suggested food pairings include fettuccine alfredo, shellfish, roasted chicken, and cheese plates. Thank to Alina for generously gifting us the bottle! We are so delighted that you enjoyed your Childress Chardonnay. Winston-Salem is known as the gateway to the Yadkin Valley wine region and we are very proud of the impressive wine selection. Another fun fact for you...North Carolina was actually the #1 wine producer before prohibition hit. We then had to turn to tobacco (R.J. Reynolds Inc was founded here and his former home is now Reynolda House Museum of American Art!). So many of those old tobacco farms are now getting back to their roots as vineyards. Learn more about Winston-Salem at www.VisitWinstonSalem.com and we hope you find yourself in our city in the near future!